Rotationally molded Daniel bowls contemporary or and transitional planters represent a viable lightweight alternative to traditional planters of clay, concrete or aggregate materials. Plastic planters are up to 50% lighter than terracotta or concrete planters. Double Wall construction provides many benefits including superior structural integrity, enhanced appearance and insulating properties for better thermal protection of plant roots. Strength and Beauty, interior or exterior, Armeria Daniel bowl containers can handle the most inclement weather conditions. Landscape architects, interior designers, contract landscapers, and interiorscapers have the capability to put the classic look of aesthetically appealing planters on rooftop decks, balconies, and other spots where weight is a consideration. 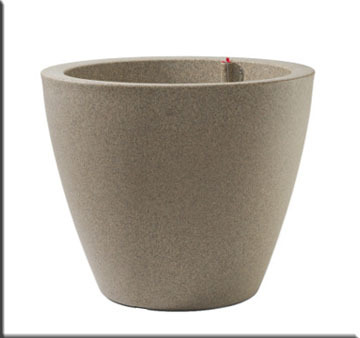 Daniel round polymer resin planters are available in 3 "Quick Ship" colors. Caviar Black, Weathered Stone, Rust ship within 48 hours. Along with 14 special order colors. 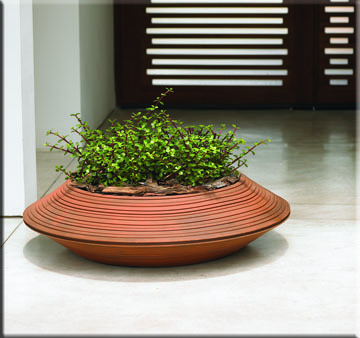 Rotationally molded Daniel low bowl planters represent a viable lightweight alternative to traditional planters of clay, concrete or aggregate materials. Plastic planters are up to 50% lighter than terracotta or concrete planters. Easy to install and maintain, our containers are ideal to tap into the water gardening market. With a broad selection of shapes, depths and sizes, these containers can accommodate a variety of water gardening plants and fish. Some planters are supplied with specialty plugs to use with fountain pumps. 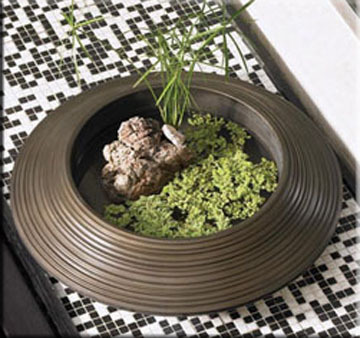 Daniel low bowl containers are manufactured with polymer type 2 resin and can be recycled. Item Description Upper Width Lower Width Internal Dia. Internal Depth Height Volume Gals.